Whether you’re moving up from Quickbooks or have an enterprise level ERP, you know that you can’t mess around with tax compliance. Imagine getting ready for IPO or hit that big buy from a major Fortune 100 company – and then find that the acquisition tanks due to a major liability in mismanaged sales tax. Ouch! Unfortunately, we’ve seen it happen time and again. Let us help you get your organization ready for the next growth phase that will put you into the three comma club. We’ve rounded up some top-notch tax experts with lots of experience working with public and private high-growth tech companies – and they’re not going to let you down in the clutch. 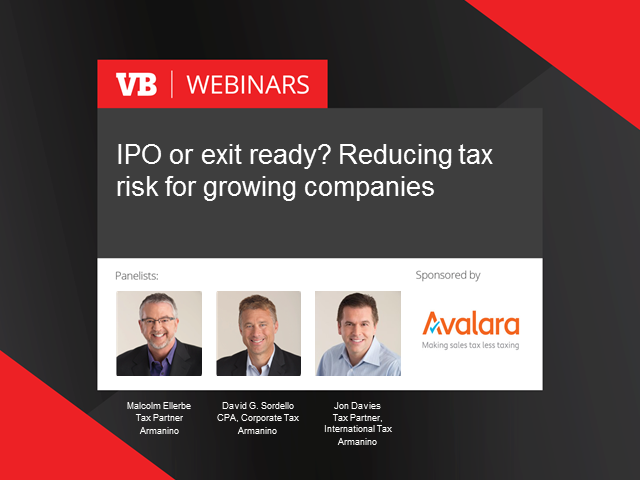 Tax partners Malcolm Ellerbe, David Sordello, and Jon Davies of the Silicon Valley company Armanino will sit down for an interactive chat with the VentureBeat audience – and are happy to take your questions as you navigate the ins and outs of sales tax in a mobile and startup culture. * Determine whether sales tax is even an issue for your organization -- you might be surprised. * Get a high level overview of other tax considerations like net operating losses, impact of stock compensation, and the states that are currently taxing cloud computing services.